I attended the Cork City Hall Wedding Catwalk Show and Exhibition to show my 2017 Collection. It was a wonderful occasion to meet with many brides, Mother of the Brides, Mother of the Groom and Guests and Wedding. They were interested in the new styles for the 2017 Weddings. I showed new colourful prints mixed with plain wovens and silks. Also I have developed new complimentary fabrics with an oiled finish. They are available in a wide range of colours inspired by 2017 – 2018 Paris Catwalk Fashion predicitions. 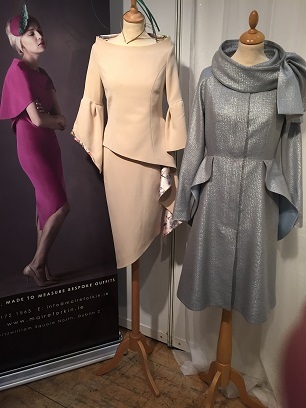 My outfits are made to measure available in a wide range of colours, fabrics and suitable for all special occasions, for examples, wedding, races etc.